This adorable mitten handprint craft is an great winter craft to do with babies and little kids. It’s a cute keepsake and makes a great winter decoration. It uses simple supplies and doesn’t take long to do, so it is great for any classroom or daycare. 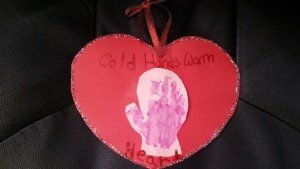 Follow the step-by-step directions below to make your own Cold Hands Warm Heart handprint craft. Step 1: Cut a heart out of construction paper. If your working with smaller children I recommend doing all the cutting as part as your prepping process. Step 2: Cut a mitten out of construction paper. If your a pro you can free hand a mitten, I myself am not a great drawer so I printed a mitten template from on-line and traced it. Step 3: Have the children glue the mitten to the center of the heart. Step 4: Paint the children’s hands and stamp them in the middle of the heart. Step 5: Write on the heart Cold Hand Warm Heart, however you like. Step 6: Use glitter or other embellishments for a personalized touch. Step 7: Poke a whole at the top to hang your ribbon.